Providence began as a sleepy farming village along the Great Salt Cove and The Great Salt River (the Providence River, today). It stayed that way into the eighteenth century, even while seaports like Newport amassed incredible wealth through the triangular trade which leveraged the sale and labor of enslaved Africans for massive profits. While Newport’s economy declined after the Revolutionary War, Providence’s fortunes turned around thanks in part to successes in the China Trade by men like John Brown. Brown even oversaw the enlargement of India Point to increase the surface area of the port to allow for more wharves–and bigger profits. Sumptuous goods from faraway lands made their way to Providence, which was quickly becoming a cosmopolitan 18th-century hotspot. Spices and silks from the East Indies were hoisted off of ships and trucked up the hill, dotting storefronts along the harbor. The distinctive smells from chocolate and paper mills and spermaceti candleworks permeated the air. 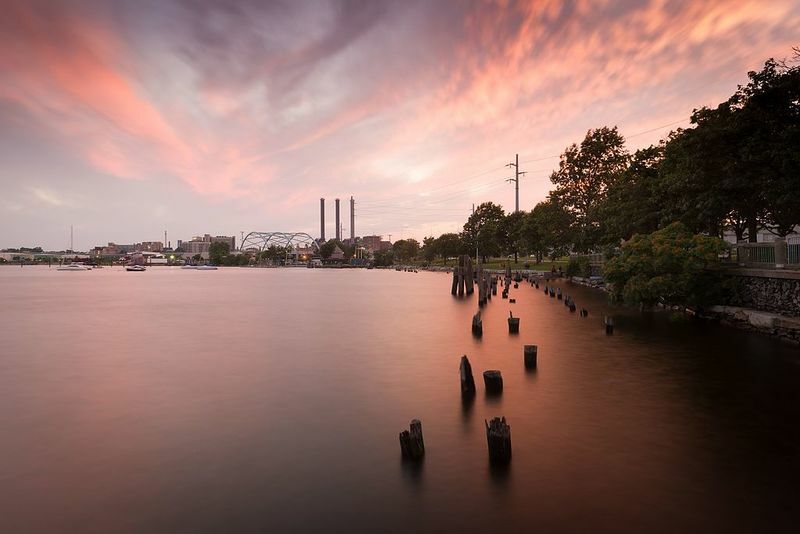 As Providence became a burgeoning industrial powerhouse in the nineteenth century, the Great Salt Cove had to yield to progress and its ensuing infrastructure. By 1898 the Cove was filled in and covered with train tracks and commercial and manufacturing buildings. 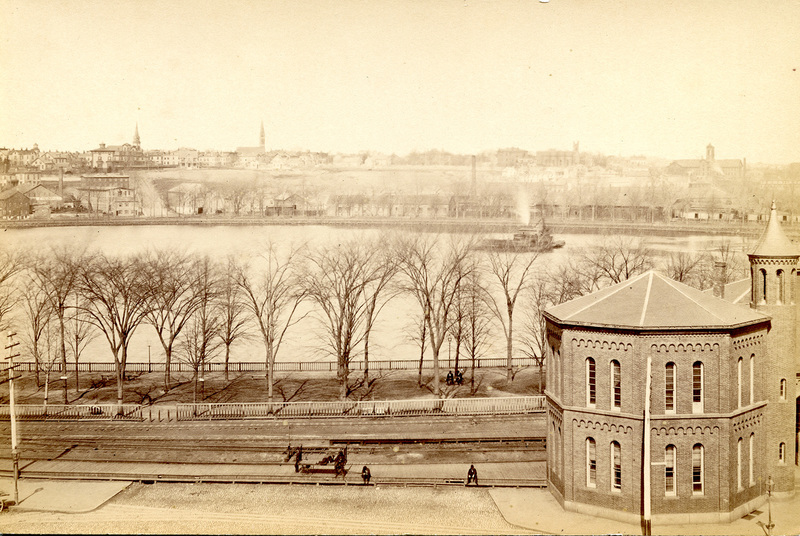 Providence Cove: This 19th-century rooftop view of the Providence Cove looks north over railroad tracks and the west end of the Tefft Union Railroad Depot. The spires of the First Baptist Church and the First Unitarian Church can be seen in the background. 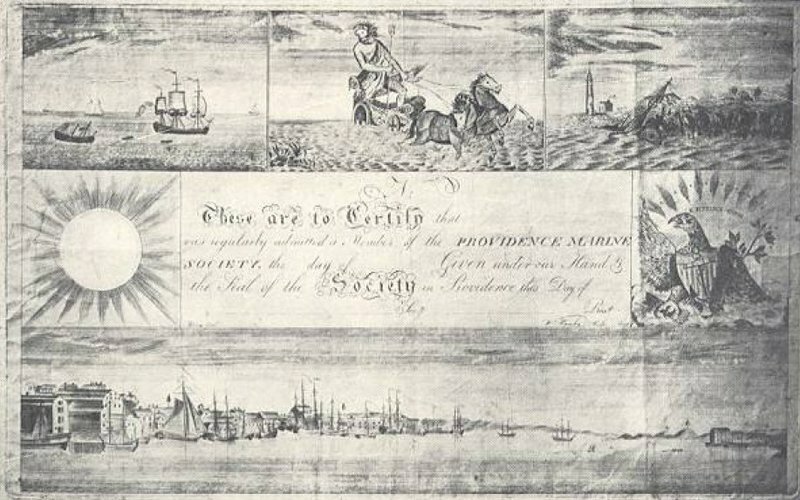 Providence Marine Society: This certificate, given to William Hamlin, a Providence engraver, depicts the city's shipping wharves. Before the Cove was filled in, the Union Railroad Depot, designed by Thomas Tefft, was constructed in 1847-1848 on land abutting the Cove. The station was the longest building in America at the time at 750 feet. You can see artist Alvan Fisher’s 1819 oil-on-canvas renderings of Providence from across the Cove on display at the John Brown House Museum on Power Street. Elyssa Tardif, “The Changing City,” Rhode Tour, accessed April 21, 2019, http://rhodetour.org/items/show/181.